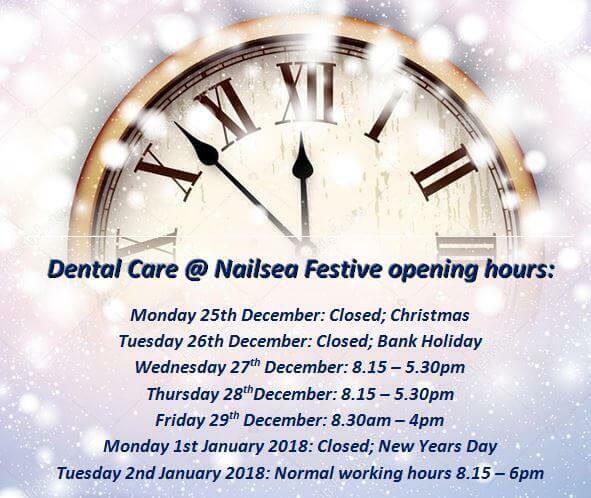 DentalCare @ Nailsea | Christmas & New Year opening times! Christmas & New Year opening times! If you are a registered private or Denplan patient at the Practice and have a dental emergency when the surgery is closed please call 01275 852143 and you will recieve the number of our Dentist on call. A charge of £125 will be made for re-opening the surgery. There is no charge if you are a Denplan patient with us. We wish all our patients a wonderful Christmas and a very happy new year.